The 300 Winchester Short Magnum is ballistically similar to the 300 Winchester Magnum but it is shorter so that you can use it in a ‘short action’ rifle. Using the familiar 0.308” bullet, the 300 Winchester Short Magnum offers ballistics that are far in excess of the 308 Winchester and 30-06 Rifles. 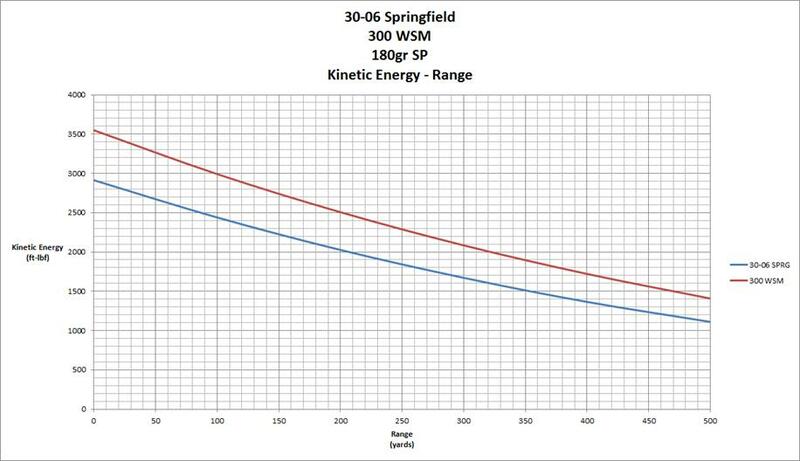 To get a better idea of the long range advantage of the 300 WSM, let’s take a look at the plot of bullet kinetic energy from the muzzle out to 500 yards (see Figure 1). At 500 yards, the 300 Winchester Short Magnum 180gr SP is equivalent to a 7.62x39mm at the muzzle. This makes the cartridge well-suited for hunting medium game animals at very long distance and makes the cartridge a fair choice for areas with large and/or dangerous game. What I particularly like about the ability of the 300 WSM to fit in a short action rifle is that you can use the same ‘stroke’ to cycle a bolt action rifle that you normally use. For instance the bolt action rifle that I have spent the most time shooting a Savage 110 in 308 Winchester. There was a time when I was very fast with the cycling of this guns action. Since 308 Winchester wouldn’t be a good large game cartridge (unless you are shooting with a 600 ft/sec tailwind), it would be appropriate to move up to a larger cartridge should you find yourself traveling into an area where a larger rifle is appropriate. How embarrassing would it be to use your muscle memory only to find that you are short-stroking the ‘long action’ rifle and in so-doing turning your rifle into a well-adorned club? It’s important to make the most of your firearms training time so that is why I like to standardize all of the guns that I own according to the similarity of operation. A person who is serious about being good with an AR-15 should avoid shooting any rifle other than an AR-15. The reason being : if you are not a Special Forces soldier, you probably don’t have the time or inclination to practice Foreign Weapons Familiarization. Keep it simple and you will be happier. Speaking of staying happier—there is a robotics revolution underway currently and if history is any indicator at all, it is safe to say that the first application of robots will be military in nature. I think that we can agree that the purpose of a military is to kill people and conquer territory. Thinking that robotics in the near future will have any other purpose is an exercise in denial. Small arms are quickly reaching a singularity of their own: innovations in lightweight armor materials are greatly outpacing developments in armor piercing ammunition. 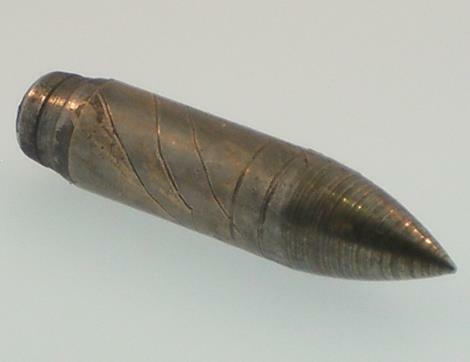 The most advanced armor piercing designs use tungsten cores—the same material as used in the 8mm Mauser SmK(H) projectile during World War II. Robotics poses a unique threat – they can be smaller than people and/or stronger than people with the use of hydraulic systems. A robotic arm could be made out of metal and can likely tolerate a hit from a rifle—a human arm protected by hard armor may still be broken from the impact of a rifle bullet. There are three defeat mechanisms if the target is a machine—direct penetration, explosion or burning of ancillary systems. World War II saw the introduction of fuel tanks that can defeat incendiary ammunition and the fuel cells of modern robots can likely be protected by hard armor plates. Incendiaries are almost a non-starter today for anything other than setting your range on fire. While there are small arms cartridges that contain explosive charges, the charge must be sensitive enough to function without a fuse but that means that the small quantity of explosive in the bullet will be of a lower TNT equivalent than a less sensitive explosive. The only practical design currently is the NAAMO Mk. 211 50 BMG cartridge … which contains enough explosive to burst the aforementioned WW-II fuel tanks and ignite the mixture with a follow-up incendiary mix. The only way for small arms to damage ‘hardened’ robotics is through direct penetration. Perhaps the reason for the scarcity of armor piercing rifle ammunition is now coming into focus? Velocity is what you want if you are trying to punch holes in things. Though originally designed for the 30-06 Springfield, the projectile for the M2 AP cartridge is a 162gr FMJ with a hardened steel core. Traveling at 3138 ft/sec this cartridge will penetrate 0.763” of RHA steel armor plate. An equivalent plate would weigh 32 pounds per square foot. That is a lot of steel but I caution that advances in lightweight composites should eventually make steel armor obsolete. What is curious about urban combat is that there is a marked need for the ability to penetrate concrete walls with bullets since concrete is the primary construction material in built-up areas. Again, amazingly, the quantity of armor piercing rifle ammunition in civilian hands dwindles by the day, as new production armor piercing ammunition is typically not available for purchase by the gun owning public in most countries. Once thought of as cheap surplus ammunition, the M2AP cartridge is able to penetrate concrete walls where small arms projectiles using the traditional lead core are unable to penetrate concrete walls. The 300 Winchester Short Magnum is an ideal platform for the M2AP—the higher velocity of this cartridge only serves to over-stabilize the bullet, which is exactly what you want if you are attempting to penetrate hard armor. A bullet will of course penetrate better the smaller the apparent diameter is to the target. If you are shooting medium game over long distances, I recommend staying with the 180gr or heavier bullet as you will be able to retain greater kinetic energy at 500 yards compared to the 165gr and lighter bullets. Closer range shots at medium game call out for the 150gr or 165gr loadings if you are not concerned with meat destruction.